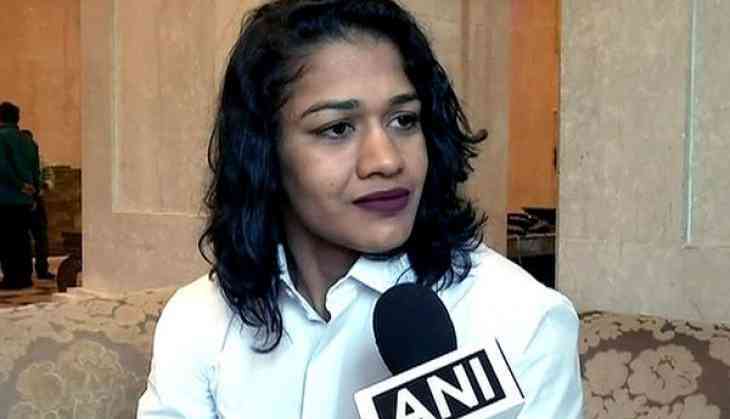 Indian wrestler Babita Phogat, who made the country proud by bagging a silver medal in the recently-concluded 21st edition of the Commonwealth Games in Gold Coast, on Monday said that winning an Olympic medal still remains her ultimate goal. Despite making a good start in the initial rounds of the summit showdown of the women's 53kg category at CWG 2018, Phogat failed to capitalise on it and slumped to a 2-5 defeat at the hands of Canada's Diana Weicker to settle for a silver medal. However, the 28-year-old from Bhiwani district of Haryana is yet striving to add an Olympic medal to her tally. Reflecting on the same, Phogat told ANI that she would continue to work towards achieving the Olympic medal till the time she bags it. "We started doing wrestling for Olympics. Winning an Olympic medal still remains my ultimate goal. It is yet to be achieved. Till the time we do not bag an Olympic medal, we will continue to work towards it," she said. Babita's comment comes before meeting Prime Minister Narendra Modi in the national capital. Talking about her scheduled meeting with Prime Minister Modi, Babita said that it feels really good when such a big personality meets the athletes and talks about their achievements. "It feels good that Prime Minister Narendra Modi talks about us and talks about our sport. It also boosts the confidence of the athletes. It's the biggest thing when a Prime Minister takes interest in athletes or sports. I don't think any of the previous Prime Ministers had taken so much interest in sports or had talked about any sport. And meeting the athletes is a far away thing. It feels really good when Prime Minister meets us, thinks about us or supports us," she said. Meanwhile, Phogat also reflected on the overall performance of the Indian wrestlers at the Gold Coast. She said that women wrestlers have now started performing really well and that it is for the first time that all the wrestlers who went for the Games brought back the glory. "Earlier, there was more focus on men's wrestling. However, now women's wrestlers are also coming forward. We have medals in Olympics and World Championships. Now, people have big hopes from wrestling. And it is for the first time that all the wrestlers who went at the Commonwealth Games brought the medal," she said. Yesterday, Prime Minister Modi, addressing the 43rd edition of 'Mann Ki Baat,' had lauded the Indian athletes over their exceptional performance at the Commonwealth Games (CWG) in Gold Coast, earlier this month. "Our athletes lived up to the expectations of the country and won medal after medal. It was a fantastic performance in 2018 Commonwealth Games.It was a time when people all over the country thought about which players will perform today. It was a glorious festival for the entire country and all the countrymen," the Prime Minister said. The 2018 Commonwealth Games have been India's third most successful CWG of all time. India won a total of 66 medals, which included 26 gold, 20 silver and 20 bronze.